With commencement only 38 days away, there are still around 30 seniors who have not yet met the MIT swimming requirement, according to Carrie Moore, Director of Physical Education. If this number does not decline by June, failing to meet the swim requirement will once again be among the many reasons seniors are forced to postpone their graduation. The Registrar’s Office was not able to provide the number of seniors who did not pass the swim test in previous years. The swim test was implemented in the late 1940s after World War II and is currently one of the General Institute Requirements. 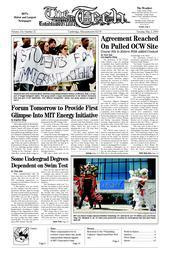 According to Cynthia Stanton of the Department of Athletics, Physical Education and Recreation (DAPER), the swim requirement is one way to reflect the equity emphasized by MIT. “It is how you earn being an MIT student.” she said. There are two ways for MIT students to meet the swim requirement — students may choose to either pass a 100-yard swim test without a time limit or attend a swim class for beginners (the fee is covered by the Institute). The Orientation swim test “is a fun time for froshes to kick off and challenge themselves,” Moore said. During Orientation, usually on the Tuesday after Labor Day, DAPER prepares for about 900 students to take the test, with 700 showing up on average in years past. Following Orientation, the rest of the student body can register for a swim class as one of their PE choices or attend swim tests held twice daily, four days a week in the Zesiger Center. To meet the special needs of some students, MIT holds a female-only swim session during IAP in odd years. Alternatively, male-only sessions are held during even years. To accommodate other personal or religious needs, DAPER also utilizes the alumni pool and sets up a private tests for students. “As a life-saving skill, swimming can help build lifelong wellness and health,” said Moore explaining why swimming is uniquely chosen above other sports to be one of the Institute requirements. Moore pointed to swimming as one of America’s more useful and ubiquitous skills. ”Parents automatically put their children into swim classes,” she said. The prerequisite swim test is also a building block for other small boat classes offered at MIT. DAPER’s survey shows that of 506 student respondents, 65 percent said that they would be interested in the small boats sampler physical education course, making it the most popular selection among all PE classes. Other universities that require a swim test to graduate include Cornell, Columbia, Swarthmore, Dartmouth, Bryn Mawr, the University of Chicago, and the University of Notre Dame.